The 3-in-1 Canon Colour imageCLASS MF632Cdw offers feature rich capabilities in a high quality, reliable printer that is ideal for any office environment. Print, scan and copy capabilities help you accomplish necessary tasks with just one machine. Easy to use features such as the intuitive 5-inch colour touch LCD panel and various mobile solutions, your business will have the support and efficiency it deserves. Your professional quality colour documents are printed at speeds of up to 19 pages per minute in both colour and black and white with a quick first print time of 12 seconds or less. Get high quality, crisp and bold colour business documents as well as photos using V2 (Vivid and Vibrant) Colour Technology, which increases image sharpness and colour vibrancy. Eco-conscious, duplex print saves you time, paper, and related costs, as well as limits interruptions. The intuitive 5-inch colour touch LCD panel allows you to navigate through the menu seamlessly. The wide screen and colour display is user friendly and easy to read. You can also customize the settings to access the features you use most. The MF632Cdw has wireless connectivity, increasing your productivity and allowing you to print from almost anywhere in your home or office. The device also has built in Wi-Fi® Direct Connection capability, enabling easy connection to mobile devices without a router. Pairing your mobile device just got easier – simply scan the QR Code function on the MF632Cdw using the Canon PRINT Business app to connect wirelessly. The MF 632Cdw use Canon 045H ink cartridges. 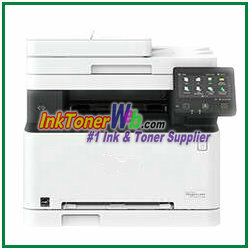 From InkTonerWeb.com, we have compatible C045H toners that include 4 colors: 045H Cyan, 045H Magenta, 045H Yellow, 045H Black. They are guaranteed to perform with your Canon imageCLASS LBP612CW, MF632CDW, MF634CDW laser printers. They replace the original Canon 045H Cyan, 045H Magenta, 045H Yellow, 045H Black toner cartridges. Our compatible (generic) replacement 045H toner cartridges are made in ISO9001 & 14001 factories and meet the highest standards of quality, reliability and exceptional yields, offering high-quality printing results as OEM 045H Cyan Magenta Yellow toner cartridges.